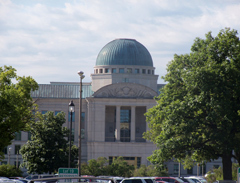 The Iowa Supreme Court is done hearing arguments and issuing opinions on cases for this term, but they are not hanging up their robes and taking the summer off. Court communications officer Steve Davis says the court has split up its duties since going to a term system about three years ago. Davis says 106 cases were submitted to the Supreme Court this term. “And they had 102 written opinions by the end of the term. Which is pretty typical for a year’s worth of work — whether they were on the term system or before,” Davis says. Two of the cases were voluntarily dismissed by the parties, one was dismissed by order of the court, and one was held over for resubmission next term. Davis says the justices now are working a variety of administrative issues. “Such as setting the budget for the year, and additionally they’re responsible for all the attorneys in the state that practice law. They are responsible for admissions to the bar, the bar exam, attorney conduct, and disciplinary actions against attorneys,” according to Davis. He says the work is split up among the justices after they talk it over. “The court will have opinion conferences when they are working on cases where they will all get together and go over cases. And then during the administrative term, they will get together in Des Moines and go over administrative issues,” Davis says. The court will handle the administrative issues through August before opening the new term where they begin hearing cases once again.